CHARLES CITY — Nine weeks into the the 32-week season of Comet Bowl’s Wednesday night men’s league, 10-Pin Heaven, Bayou Bend is atop the standings followed by MTE and then Jendro Sanitation. Bayou’s team members are Richard Burham, Mike Ross, Denny Carr, Jeff Wink and John Ayers. Wink has the second highest scratch game of this early season at 279. 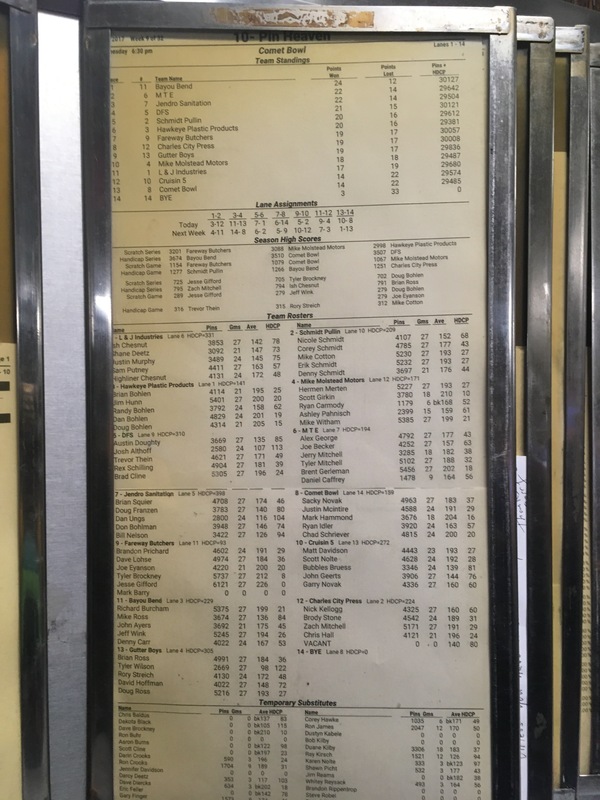 The top game is a 289 rolled by Jesse Gifford of the Fareway Butchers, which owns the highest scratch series of the season at 3,201 and the highest scratch game at 1,154. Bayou Bend has the season’s best handicap series score, so far, at 3,674, and the second best handicap series at 1,266. Schmidt Pullin has the top handicap series at 1,277. Bayou Bend will face 10th place Mike Molsted Motors this week (Nov. 9) on lanes 1-2. This entry was posted in Community and tagged Comet Bowl. Bookmark the permalink.